After a winter that just wouldn't go away, the Spring arrival of The Big Apple Circus on Boston's City Hall Plaza is always good news. Once again populated by international artists, this year's edition -- Big Apple's 33rd -- is entitled "Dance On." And there's no mistaking the theme when Mark Gindick (at left) races out at the top of the show and begins dancing up a storm. The multitalented Gindick is becoming a Big Apple favorite having previously supplied comic relief as an endearing clown in big glasses, tuxedo shirt, big bow tie and suspenders. Here, he returns again and again throughout the show to bop around, often diverting your attention while the next act sets up in the dark. High points of this year's show, hosted by Ringmaster Kevin Venardos and under the direction of Guillaume Dufresnoy, include the X Bud Roses Troupe (below, left) from Mongolia. In a world where the word "amazing" is becoming increasingly overused, here it is more than appropriate. These five young women bend and twist and contort themselves into positions that seem impossible if not downright painful. Truth be told, when two of the ladies held onto a performance platform with nothing more than their teeth, I just couldn't look. From Ethiopia, Girma Tshehai presents a clever demonstration of juggling while bouncing tennis balls off the various angles of a multi-surfaced w-shaped acrylic frame. The Wuqiao Acrobatic Troupe first hit the ring on monocycles, only to return later with a rousing jump rope lasso act. 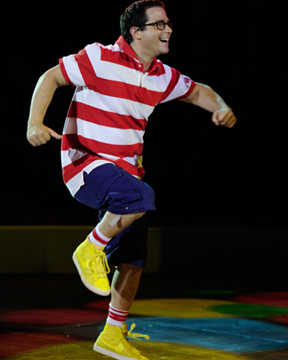 Another long time member of the Big Apple Circus troupe is Andrey Mantchev. This time around, the young Bulgarian native does a solo balancing act on a circular platform that appears to float above the circus floor. And speaking of floating, Regina Dobrovitskaya soars over the playing area on her cloud swing. Handling the comedy are Rob Torres, who juggles tin cups when he's not sending his boomerang of a hat out into the crowd. And of course the one and only Grandma, who cavorts in and out of the ring. Calling upon one of her more popular routines, the old girl works out on a treadmill to the delight of everyone in the audience (the six-year-old sitting next to me thought she was just about the funniest thing he had ever seen). Other acts include The Kenyan Boys who defy gravity by scampering up and down a pole at center stage, and Jenny Vidbel (at left) who puts her troupe of a dozen mini-horses through their paces. As always, the dynamic Big Apple Band under the direction of Rob Slowik is sharp throughout the show. The only disappointment in this year's edition is the first-ever absence of tightrope or high-flying trapeze artists. There's something thrilling about watching death-defying performers like that so close. Which brings to a major point about the Big Apple. With only one ring, the show is very intimate. No seat is more than 50 feet from the performance area, which really gives you an up close look at the proceedings. 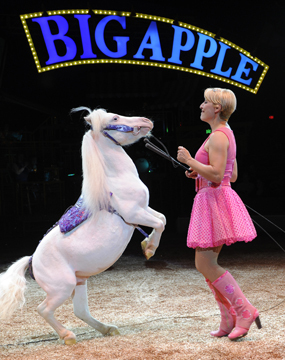 As always, it's important to note that The Big Apple Circus is more than just a world-class performing arts company. 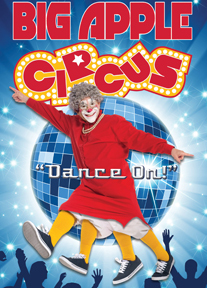 The not-for-profit organization also offers a wide range of community outreach initiatives for hospitalized, handicapped and underprivileged children including Clown Care, Vaudeville Caravan, Circus After School, Circus For All! and Circus of the Senses programs. "The Big Apple Circus" is at City Hall Plaza in Government Center through May 15. For information, call 800-922-3772.